Dysderids are six-eyed haplogyne spiders. Dysdera crocata the woodlouse hunter is cosmpololitan. Dysderids have very large chelicerae, which they use to pierce the armored bodies of their prey. 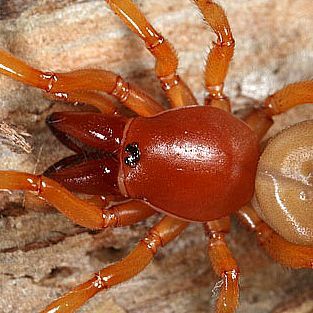 These rather large, burly-looking, slow-moving spiders are often seen looking for a winter shelter in the autumn in basements and other cool areas of homes.